I wrote a bunch of posts on bitcoin between 2012-2015, but they tailed off a bit in late 2015 and 2016 as my attention turned to other subjects, namely old fashioned banknotes and cash, a terrifically fertile topic. Because my bitcoin posts tended to get a lot of comments at the time, I thought it would be worthwhile to go back and review some of the predictions I made, both for my sake and that of my readers. My predictions tend to fall into three related buckets. On the first front, I've consistently written that bitcoin won't become a generally-accepted medium of exchange because of its volatility. And this prediction has panned out, so far at least. No, bitcoin has not destroyed VISA, nor has it driven the share prices of remittance providers like Western Union to zero, nor has it been adopted by unbanked Africans and Bangladeshis. From a more anecdotal perspective, I live in what I like to think is a fairly vibrant part of Montreal filled with early adopters, but I never see shops or cafes that accept bitcoin. None of my circle of friends and family have ever tried the stuff, and when they ask me about it, it's always to gossip about the crazy high prices—not bitcoin-as-a-medium-of-exchange. Let's face it, bitcoin and other cryptocoins are great speculative vehicles, but they're flops as money. On the second front, I've written about how the distributed ledger aspect of bitcoin could be split off from the token itself and used by financial institutions See here, for instance. This is the rough idea behind the "blockchain" movement that started up in 2015 or so. We'll see if it pans out. I also predicted that central banks would adopt bitcoin technology before banning it, perhaps in the form of a distributed currency, and have since wrote multiple posts on the Fedcoin idea. No central bank has quite got there yet, but they've all started talking about digital currency and have even been experimenting with it. So I think I've done alright on these predictions. "My hunch is that bitcoin still has a positive value because proper competition will take a few years to truly develop. Let's see where we are in December 2013." "There is no way to arbitrage this premium away directly, but over time competitors will peck away at it, causing bitcoin's price to deteriorate back to its fundamental value, which I'd guess is <$1." "If I'm right, in the future bitcoin will be a smaller part of the cryptocoin world than it it now, whereas stable-value non-bootsrapped crypto assets, like Ripple IOUs, will be a larger part of that world." To further illustrate how bad I got this one,I once owned 24 bitcoins. I bought them back in the fall of 2012 for around C$12 each (~US$10) for a total outlay of C$290. Thinking I was a genius, I sold out the next year when the price hit C$100, earning what thought to be a nice 700% return. Had I ignored my prediction and held, given today's bitcoin price of ~CAD$3000 my small stash would be worth a cool C$72,000. Ouch. That's not fun to read. Given this incredibly wide miss, it's high time to re-evaluate my reasoning for a zero price of bitcoin. Do I turtle-in and keep my prediction or do I update it? Here's how I've been thinking about the problem. There are two types of assets in this world. Type A assets can only provide a return to their current holder if a stream of subsequent investors, buyers, or participants are recruited to provide that return. Examples include Ponzi schemes, chain letters, and pyramid schemes. Type B assets, on the other hand, can provide a return to their owner, even if no subsequent person ever steps forward to acquire that asset. Good examples of Type B assets are gold, land, stocks, and central bank-issued banknotes. Say a buyer's strike suddenly hits the market for a Type B asset. Everyone decides to sell at the same moment so that the asset is offered at $0. An arbitrage opportunity presents itself. Since this asset will either yield a dividend (in the case of a stock), have some usage in decorating (like gold), or is destined to be repurchased by its issuer at some positive price (think central banks withdrawing banknotes by selling assets), anyone who buys it for $0 is getting something for nothing. As people compete to feast on this free lunch, prices will re-ratchet back up until the opportunity has disappeared. For this reason, Type B assets are characterized by price floors and buyers strikes are not crippling. No equivalent arbitrage opportunity presents itself when a buyer's strike hits a Type A asset. Say Bernie Madoff issues a bunch of tickets, each providing its holder with a spot in a Ponzi scheme. A few days later, no one wants to purchase Madoff's tickets. Sure, you can now buy a ticket for $0, but because they have no intrinsic value the only way you'll be able to come out ahead is by selling it for more to another buyer, say for $1. This will require that you (or someone else) incur expenses on marketing the scheme i.e converting already angry sellers into buyers. This sounds like an awful lot of work, certainly too much to merit paying anything more than $0. Probably better to start an entirely new Type A asset than try to reboot the failed one. The upshot is that because Type A assets lack an arbitrage mechanism and marketing is costly, buyer's strikes quickly bring the game to an end. There is no floor. Bitcoin is a Type A asset. It is unconsciously so, there being no Madoff-like evil genius at the centre of the scheme. It just sort of emerged spontaneously. Like other Type A assets, bitcoin lacks a price floor. When a bitcoin buyer's strike hits, and bids across all the bitcoin exchanges evaporate, a bitcoin held in your wallet is worthless. There is no underlying business that can throw off dividends nor a central issuer that can cancel unwanted tokens. Sure, you can always purchase a bitcoin for $0, but in order to come out ahead you'll have to convince someone to buy it for $10. This means you'll have to regenerate the hype, excitement, and belief that initially spawned a positive bitcoin price. If you're not willing to spend time and money on these efforts, you better hope someone like Andreas Antonopoulos will. Whatever the case, any effort to push bitcoin back into positive territory will be costly. Given that buyer's strikes are the death knell for Type A assets, it is vital to recruit a constant stream of new buyers to the cause. In bitcoin's case, recruitment has been easy. No Ponzi scheme ever boasted as engaging a mythology as bitcoin, starring the dashing and mysterious Satoshi Nakamoto, a radically decentralized digital currency poised to destroy the existing financial system, and "in math we trust". Because these ideas are so catchy, the mythology has pretty much sold itself—an incredibly cost-effective way of recruiting new participants. Every time bitcoin has experienced a lull in buying and its price has plunged, it has never quite fallen to zero. A batch of new converts, inspired by the latest Andreas Antonopoulos video on YouTube, has always emerged from the woodwork. While the mythology is strong, it has long since spread into the easy cracks, i.e. libertarians and tech geeks. New target demographics, many of which do not agree with the core philosophy underlying the mythology, won't be so easily convinced to add their bids to the queue. As for Satoshi Nakamoto, he/she is almost ten years old now and getting stale. And one of the core promises of the mythology, the birth of a generally-accepted digital currency, has fallen flat. People are getting jaded. Luckily, Bitcoin has always had a far more seductive recruiting tool, a rapidly rising price. While the technology and philosophy underlying bitcoin might motivate a few geeks, a 50% price jump is a universal intoxicant. Past returns bring the promise of future returns, waves of new buyers pushing the stuff ever higher. However, this process faces limits. The bigger bitcoin gets, the larger the stream of recruits needed to drive the price higher. At some point its market capitalization will get so large that the population of buyers necessary to keep the ball rolling will be exhausted. And when bitcoin can no longer demonstrate that it offers a superior return, a buyer's strike will hit as everyone rushes to sell at the same time, it's price falling to zero. So in the end, even though I've been terribly wrong I'm going to stick to my guns on this one. If I'm going to recant my bitcoin-to-zero views, you're going to have to convince me that a Type A asset can last indefinitely. I don't see how. Empirically, we know that Type A assets are precarious, short-lived things. There are no Ponzi or pyramid schemes still running from the 1800s, or the 1920s, or even from 2001. Bernie Madoff's Ponzi scheme, which popped in 2008, may have been the longest running Type A asset ever, it's alleged start date being the early 1970s. That's over thirty years. (Public run pension schemes don't count, since the government can coerce participation). If there is a reason that bitcoin can escape this fate, please explain in the comments section—maybe I'll see the light. Americans and Canadians take for granted that fact that while a multiplicity of dollar brands circulates in our respective nations, a dollar is always equal to a dollar. In the U.S.'s case, whether it be a VISA card, paper money issued by the Federal Reserve, or a deposit created by a either a big bank like Wells Fargo or a tiny one like Wisconsin Bank & Trust, a retailer will (almost always) accept each of these monies at the same rate. Compare this to Zimbabwe where a phenomenon called three-tier pricing has emerged over the last few months. Retailers have begun to charge customers three different prices for goods and services depending on the brand of dollar being used: a paper U.S. dollar price, another in "plastic money" (i.e. local U.S. dollar-denominated bank deposits transferable by debit card), and the last price in terms of relatively new parallel paper money called bond notes. You can see that the list of goods being sold is denominated in U.S. dollars, bond notes, and "swipe" i.e. plastic money. Under three-tier pricing, those who pay with U.S. dollars get the lowest price while anyone who pays with plastic money faces the highest price. For instance, the item labelled Kingsize (cigarettes maybe?) retails for $9 in U.S. banknotes, $9.50 in bond notes, and $10 in plastic money. Given these rates, the shop estimates that a US$100 bill is worth $105 in bond notes and $111.11 in deposits. These rates are generous. There are reports (see here, here, and here but there are many more examples) that bond notes and plastic money often trade at discounts as deep as 20-30% to U.S. dollars. Three-tier pricing may seem odd, but it is actually the market's natural response to a breakdown in the fungibility, or substitutability, of various types of money. While plastic money and U.S. paper money used to be perfect substitutes (i.e. they traded at par) from 2009-2015, over the last twelve months the quality of plastic money has rapidly deteriorated relative to U.S. paper dollars as it has become increasingly apparent that a bank deposit is a claim on the Zimbabwe government rather than on an actual U.S. dollar. Needless to say an IOU issued by the Zimbabwe government is not a very good claim to own. As for bond notes, a paper dollar look-alike originally issued by the central bank at the end of November 2016, they were supposed to be pegged 1:1 by equivalent U.S. dollars held in accounts at an international development bank, the African Export Import Bank. But this promise has proven to be a dubious one as the peg has not held. In this context, three-tier pricing is a way to recognize the fundamental breakdown in fungibility by rewarding users of the highest quality medium, U.S. banknotes, with the most advantageous price, and penalizing users of the lower quality mediums--bond notes and plastic money--with less advantageous prices. (To see why bond notes are worth more than plastic money, see the appendix below). Retailers and wholesalers shall sell any particular product for the same price irrespective of the mode of payment and desist from multiple pricing of goods on account of mode of payment (cash, Real Times Gross Settlement (RTGS) and Point of Sale or a combination of any two or more of them). For the avoidance of doubt, retailers and wholesalers shall not charge any premium for the sale and purchase of their wares on the basis of mode of payment. Similarly any cash or quantity discount shall, in accordance with best practice, be granted in the normal course of business and not on the basis of the multiple pricing system. The penalty for not accepting cash and plastic money at par is up to seven years in jail. 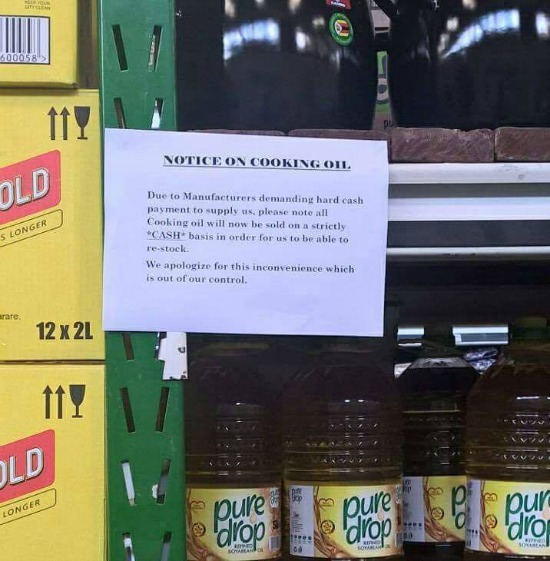 By forcing retailers to accept all brands of money in Zimbabwe at par, Mugabe is interfering with the market's natural response to a breakdown in the relative quality of different monies. His actions will inevitably set off a specific set of responses dictated long ago by Gresham's law: if the government specifies the exchange rate at which money must be accepted by the populace, then the good, or undervalued money will be chased out by the bad, or overvalued money. We know from its relative position in the three-tier pricing mechanism that plastic money is Zimbabwe's worst money. By requiring retailers to accept the two paper monies--U.S. dollars and bond notes--at par with the inferior money, plastic, Mugabe is forcing retailers to dramatically undervalue paper currency. As per Gresham's law, Zimbabwean shoppers who own U.S. dollars and bond notes will prefer to hoard and/or export them rather than spend them at artificially undervalued rates, using only plastic money to buy things. Thus the bad chases out the good. Media reports concur with this prognosis. U.S. paper money, which had already started to disappear back in November when bond notes were declared legal tender, is all but impossible to find. And now bond notes are getting more elusive too. To try and fix the very problem it has created, the Reserve Bank of Zimbabwe--the nation's central bank--has initiated a whistle-blowing campaign against cash hoarders. Good luck with that; cash is very easy to hide. If the authorities really want to end cash hoarding, they should re-legalize three-tier pricing. With the market sorting mechanism reestablished, the true value of cash will once again be recognized and banknotes will flow back into the market. Of course, these prices will only bring back the premium on U.S. dollars, making it terribly obvious to all how poorly the government's credit is esteemed by the market. Unfortunately, this is exactly why three tier pricing is unlikely to be legalized. This situation won't have a happy ending. I had been meaning to include the following bits in the main body, but on second thought decided to put them into an appendix. What follows is a quick history of how each of the three tiers has developed. In 2016 a two-tier system emerged when U.S. banknotes and "plastic money" ceased being fungible (bond notes had not yet been created). The nation's central bank--the Reserve Bank of Zimbabwe (RBZ)--reopened for business sometime after the nation had dollarized. It began to offer U.S. dollar accounts, or IOUs, to local banks for the purposes of settling interbank payments, later forcing them to keep a certain amount of money on deposit at the RBZ. In theory, these IOUs were supposed to be fully backed and convertible into genuine U.S. dollars, a promise that has proven to be a tenuous one as the RBZ has been rationing access to U.S. dollars since early 2016. With redemption now impeded, U.S. dollar deposits had effectively been decoupled from U.S. cash. By mid-2016 a black market of sorts had developed in which cash, the superior money, now traded at a premium to deposits, or plastic money. To cope with this lack of fungibility, retailers came up with an ingenious workaround; they began to set a cash price and a "plastic money" price, the cash price being lower. But this single-tier pricing strategy inconveniences customers with bank accounts and may attract the disapproval of authorities. The third tier emerged when the RBZ introduced its own parallel issue of U.S. dollar banknotes, called bond notes, at the end of November 2016. This parallel currency currently comes in $1, $2, and $5 denominations, although the RBZ had earlier promised to introduce higher denominations. In its initial announcement, the government had promised that bond notes would be fully backed and redeemable in genuine U.S. dollars provided by an international development bank, the African Export Import Bank. But this redemption promise is not being kept [source]. Those who want to redeem bond notes for U.S. banknotes have found that they face the same hurdles as those who want to redeem deposits. Thus, just as deposits have been decoupled from U.S dollars and fallen to a discount, so have bond notes. Although deposits and bond notes are both inferior imitations of the U.S. dollar they do not themselves trade at par with each other, bond notes being valued at a premium to plastic money. My guess is that this has to do with the fact that, till now at least, the supply of bond notes has been kept to ~$120 million, with the government reportedly unwilling to issue more. 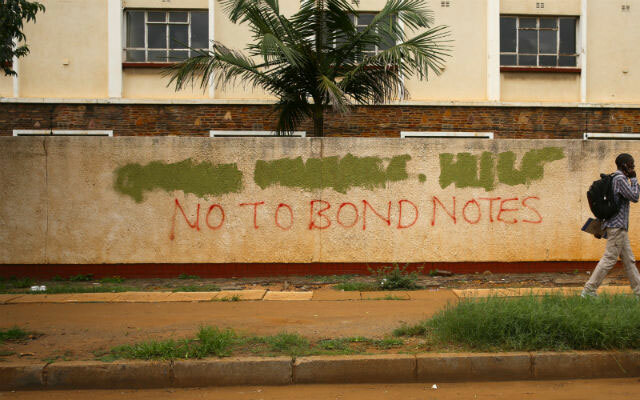 [source] Given the fact that many Zimbabweans do not have bank accounts and only transact with paper, the limited amount of bond notes that has been created is insufficient to meet the nation's demand for cash. So there is a scarcity premium built into the price of bond notes. ** The other way of emptying one's bank account, wiring dollars overseas, has likewise been constricted as foreign exchange is tightly rationed by the central bank.